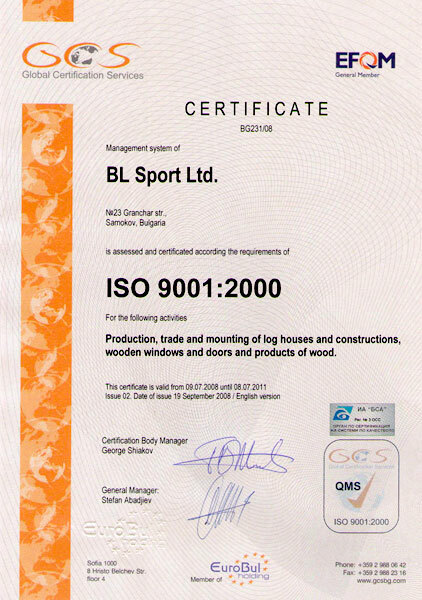 BL Sport Ltd was established in 1998. We manufacture prefabricated log houses making use of a Finnish technology. We possess our own production facility which is being constantly renewed, upgraded and optimized. We have the ambition and the potential to build cozy and attractive homes for our clients. Our team of professionally trained people is a guarantee of success. We meet all wishes and requirements of anyone who trusts us to build their home. The awarded certificate on the quality management system under ISO 9001:2000 is a proof of our professionalism and we are committed to maintain and support it.